IOBit Smart Defrag 6.1.0.118 Portable » TopFreeSoft.Net - Best Freeware Software! 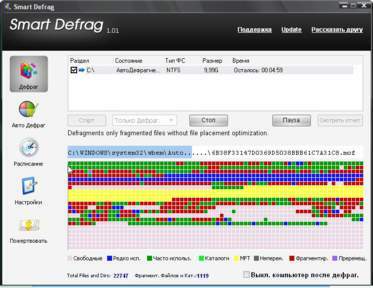 IObit Smart Defrag optimizes your PC to take full advantage of SSD performance while defragmenting your hard disks. Its SSD Trim tool automatically enables system tweaks that typically require experience to apply. Smart Defrag Trim tool applies the important TRIM command that helps keep your SSD clean and fast. The Trim tool even has its own disk map. Faster PC & Quicker Access Speed. Trim & Intelligent Optimize: It trims your SSD and optimizes it to improve the performance and extend the life of your SSD. If you tick both HDD and SSD, you can see Smart Optimize button. Clicking this button will analyze first and then intelligently execute the most suitable method to defragment your HDD and trim your SDD with one-click. Nobody wants to experience long game load time. Game Optimize in Smart defrag can optimize your game experience quickly with ultra-fast engine, and all you need to do is select the game you'd like to defrag.